Lyle: Key of G for this groove. 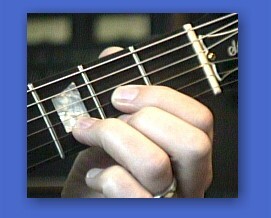 The background is made up of 3 simple chords: G, C and D.
kenny_jr: Which pickup are you using, the Bridge or Neck pickup? Lyle: For the tone of the rhythm part, use the bridge pickup and not too much distortion. Don't use any other effects. Angus plugs straight into a Marshall for his tone. Lyle: Let's move into learning the solo from the Lesson Sample. This solo uses the G minor Pentatonic scale. Angus is the pentatonic King. 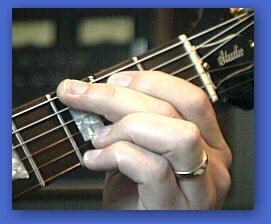 Lyle: Nice, fat bends with heavy and fast vibrato is a key element to the Angus sound. Lyle: Try to play riff 1 and 2 back to back with the jam track. Lyle: This next riff has a heavy vibrato on the last note, first finger. Be sure you're listening to the audio clip of each TAB file. vbisbest: Is there any trick to bending the string that far? Lyle: You'll see in the video clips when I'm bending a string, I grab it with several fingers at a time for better control and strength. Lyle: The next 2 riffs you'll want to notice the slight difference between them. 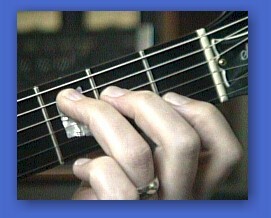 Lyle: The next lick changes your position on the neck to help setup for a killer ending to the solo. Lyle: Notice how you started the solo down low on the neck and here we are, near the end of the solo, playing high up on the neck. This is what I like to call good solo composition. Lyle: Lots of licks here. You might not be able to memorize all of them, but at least try and memorize the ones you like. Lyle: Remember that you don't need effects other than bit of overdrive for the Angus sound. Satch: I have this digitech thing called rp200 and it has an effect specifically for angus young but there is barely any distortion on it? Lyle: Right, Angus doesn't use much distortion sometimes. Lyle: All the rhythm parts to these lessons are in the Malcom style too.